Category 1 A is our largest and best situated cabins. All cabins in this category has a window so you can really enjoy the view as we sail. Beds are on floor level, on at each side. Bathroom with shower and toilet. 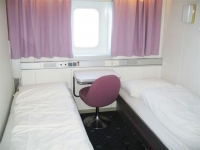 A small workstation with a chair will also be present in most of these cabins. You can find CAT 1 A cabins on deck C, D and E. Cabins on E deck is normally the most popular ones.